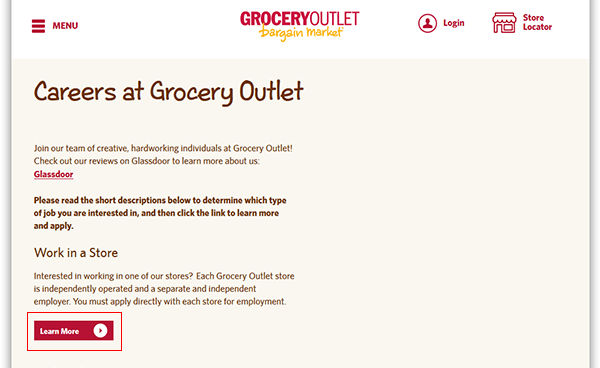 Read the instructions posted on this page to learn how to access the official Grocery Outlet job application (online version). Numerous current openings can be applied for by creating an online account and going through the application process. The instructions posted below detail how to create an account, search for current openings, and fill out/submit an application. 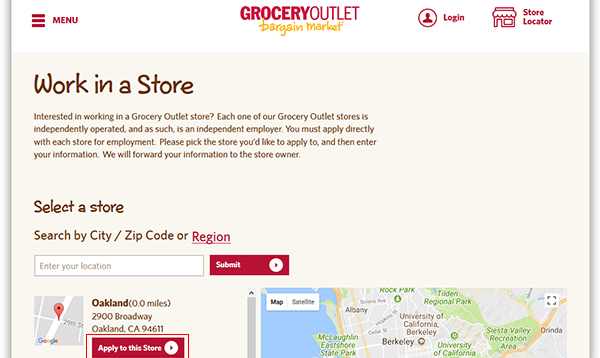 About the Company: Grocery Outlet is an American chain of supermarkets based out of Emeryville, California. The company was founded in 1946 and operates numerous locations throughout the Western United States (as well as some locations on the East Coast). More than 250 locations can be applied to online via the company’s employment site. Step 1 – Go to the company’s employment site by pressing this link. 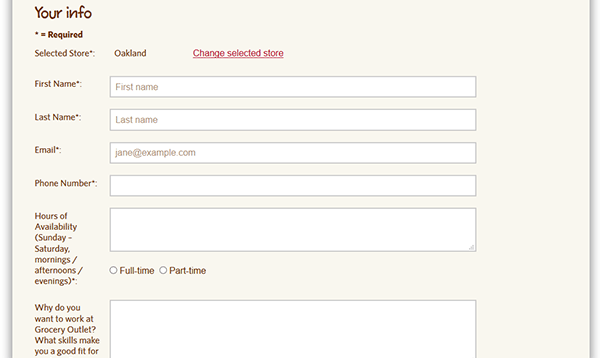 Step 2 – Once you’re on the careers site press the “Learn More” button underneath the “Work in a Store” subsection. Note: This guide details how to search/apply for in-store positions. You can also search/apply for corporate positions as well. Step 3 – Select the store that you want to submit an application to. You can search for store locations by entering your zip/postal code into the search form. Step 4 – Click the button as outlined in the below screenshot to go to the next step of the process. Step 6 – Because each location is independently operated you must follow up with the store’s manager after your profile has been submitted. The online application form only forwards your information to the store that you’re applying to.